Even if you do have budget to start your own scrappy brand newsroom, industry studies show you’re probably still going to be challenged to create a variety of engaging content on a consistent basis. On top of that you have to find the talent to build out your content team, which is another challenge cited by the CMI/MarketingProfs B2B Content Marketing Benchmarks, Budgets and Trends report. How can companies scale content quality & quantity without scaling resources? I think there are several answers to that depending on your situation, but one avenue worth pursuing is the notion of adding more participation to B2B content marketing. What is participation marketing? It’s not just another name for UGC or crowdsourcing, which are similar ideas, but more of a focused and collaborative effort between brands and their communities to create mutually beneficial content. Participation Marketing is the democratization of content creation and promotion by co-creating content with subject matter experts, influencers and your community. When I talk to B2B marketers about content marketing programs, I usually focus on a mix of evergreen, curated, co-created and repurposed content. The notion of participation in content marketing emphasizes a mix of these content types, but focuses most on the notion of content co-creation – the most logical way for people to participate in content development. Intuit QuickBooks Small Business, Big Game: For the second year in a row, Intuit is running a program with it’s QuickBooks product called “Small Business, Big Game” where small businesses can create a profile and attract votes in the hopes of winning a Super Bowl commercial. The co-creation element comes in to play with ongoing tasks for each entrant, many of which result in the creation of useful content for other small businesses. Attracting votes for their content, small businesses gain themselves exposure and Intuit scales relevant, useful content for its target audience. 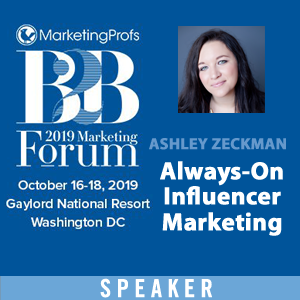 Event Content Co-Creation with Influencers: Another great example of B2B content co-creation is the influencer content programs TopRank Marketing creates around events. By inviting speakers at conferences to contribute practical tips as a preview to their presentations, they are helping to co-create a useful, collective resource for the overall marketing industry, exposure for themselves and for the conference. The core contributions are organized by theme and are repurposed in numerous ways from ebooks to blog posts to infographics to social content. Increasing content marketing performance while lowering costs is pretty compelling and that’s why, at TopRank Marketing, we’ve been developing our own processes around the practice of co-creation of content. 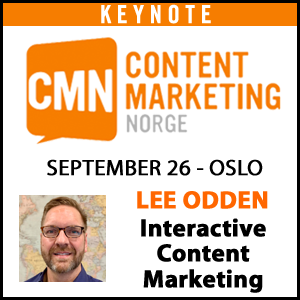 So how do you implement more participation and content co-creation in your content marketing programs? Outside of understanding the information discovery and consumption preferences and action motivators of your target audience of business buyers, it’s a modular approach to content that can really help co-created content scale. 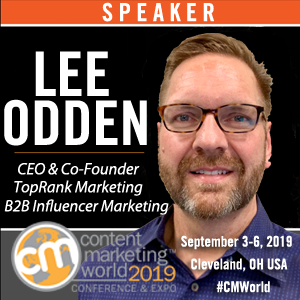 Along with Andrea Fishman, Partner in Advisory Practice at PwC and Robert Rose, Chief Strategy Officer at Content Marketing Institute I’ll be presenting a B2B view of how to leverage more participation in content marketing. Let’s face it, creating a variety of engaging content on a consistent basis is hard. Brands imitating publishers are frustrated and looking for a new ways to scale quality content that gets results. The good news is that most companies have a tremendously valuable collection of resources right in front of them: customers, employees and community. B2B brands that can connect with these groups on relevant areas of interest can partner to co-create content for mutual benefit. The result? Scalable, quality content with an investment from the very community it’s intended to reach. Everybody wins! 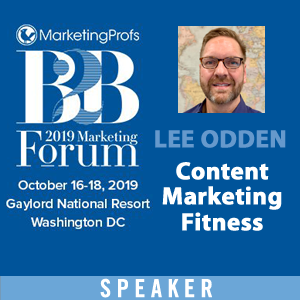 Join TopRank Online Marketing CEO, Lee Odden, on a journey from content mediocrity to content marketing democracy aka “participation marketing”. 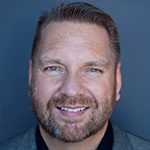 He’ll share his first-hand experience at developing co-created content programs for B2B companies big and small to attract more relevant audiences, actively engage communities and inspire more prospects to become buyers. Whether you’re in Minneapolis this week or Boston later in October, I hope to see you at one of these upcoming events. In the meantime, we’re creating a new guide to Participation Marketing, so post your most pressing questions in the comments and we may answer them (with credit to your question) in the guide. Gosh this makes a ton of sense, especially when you have someone in your company who is doing things like live streaming, podcast appearances, etc. I’ve always looked at those opportunities as ways to repurpose and reposition your own content, but I think this session at #MPB2B is going to give me more clarity on how to make that happen. Thanks Lee!